SEATTLE — To commemorate Feb. 22, 2011, as the 17th annual “Spay Day,” the Seattle Animal Shelter’s Spay and Neuter Clinic is offering FREE spay/neuter packages to Seattle pets scheduled for surgery on Feb. 22, 23, 24, 25 or 28. The package includes vaccinations and microchip and is worth between $135 and $195. To schedule an appointment, call 386-4260. To take advantage of this special offer, pets must have a current Seattle license or one may be purchased on the day of the appointment. For altered cats, a one-year license costs $20, $27 for two years; and for altered dogs, it’s $27 for one year, and $37 for two years. This year’s special offer of FREE spay/neuter packages is made possible by a bequest from a shelter supporter in honor of her surviving companion animal, Onyx, a female cocker spaniel. “We sincerely appreciate this generous bequest which enables us to make this special offer to commemorate Spay Day. 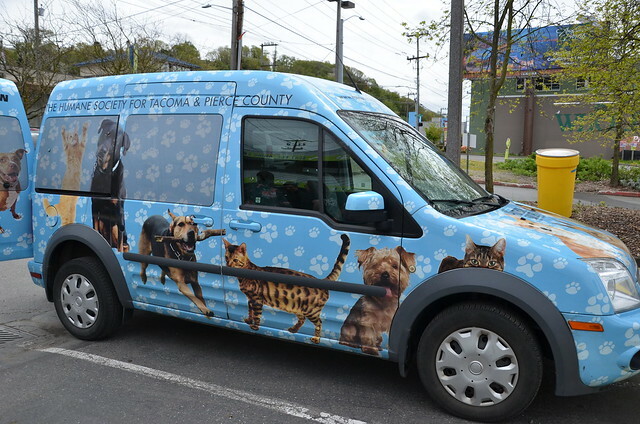 I can think of no better way to honor a beloved pet than to try to help prevent unwanted births and reduce the needless suffering of homeless animals,” says Seattle Animal Shelter Director Don Jordan. “Spaying and neutering allows your pet to have a longer, healthier, happier life,” adds clinic Director Dr. Mary Ellen Zoulas. Year-round the Shelter provides financial assistance through the city’s “Pet Population Control Fund,” to pet owners in need for spaying and neutering their pets. For more information about Spay Day Seattle, to make a donation to the Pet Population Control Fund, or to learn more about other Seattle Animal Shelter services, call (206) 386-PETS (7387), or visit www.seattleanimalshelter.org. In hopes of preventing more unwanted and abandoned litters of kittens this spring, the Seattle Animal Shelter is offering 2-for-1 Spay/Neuter surgeries for unaltered female and male cats. The offer is good until the end of April. The full price for spaying is $90 (female cats) and for neutering is $85 (male cats). Both cats must be present for surgery on the same day and Seattle residents must obtain a pet license for any unlicensed cats. Cats need not be from the same household. This offer is made possible from donations to the Shelter’s Pet Population Control Fund. With the beginning of spring, unaltered cats are coming into heat and mating. Owners of unaltered cats can “beat the heat” if they act quickly. Telltale signs of your cat coming into heat are males who develop wanderlust and females who become very affectionate and very vocal. “Every spring, our shelter takes in hundreds and hundreds of unplanned and unwanted kittens who are abandoned or surrendered by their owners. We’re asking cat owners to help fight this serious problem of pet overpopulation by taking advantage of this offer and have their unfixed cats fixed before they go into heat,” says Dr. Mary Ellen Zoulas, staff veterinarian at the Seattle Animal Shelter’s Spay and Neuter Clinic. The clinic offers lower-cost, high-quality spay and neuter surgeries. Dr. Zoulas and her skilled surgical team combine “best practices” in surgical technique, anesthesia, and analgesia to ensure that each cat’s surgery and recovery is safe and uneventful and its stay at the clinic as pleasant as possible. Additionally, the spayed and neutered cats will benefit by showing a decreased desire to wander and a lesser chance of certain types of cancer. The Clinic is located on the north end of the Seattle Animal Shelter at 2061 15th Ave. W., about one mile south of the Ballard Bridge. Surgeries are performed Monday through Friday. To schedule an appointment, call (206)386-4260. To make a donation visit www.seattleanimalshelter.org or send a check to The Pet Population Control Fund, C/O Seattle Animal Shelter, 2061 15th Ave. W., Seattle, WA, 98119. The Seattle Animal Shelter is asking all cat owners to help “beat the heat” this year and have your cats spayed or neutered before mating season begins and they go into heat. If you are the owner of an unspayed or unneutered cat, you may start noticing your male cat developing wanderlust and your female cat becoming very affectionate and very vocal. As winter comes to an end and the warmer weather and longer days of spring approach, your unfixed cats will start coming into heat. As a result, each year thousands of unexpected and unwanted kittens are born. “To help lower the number of kittens that are abandoned or surrendered to our shelter in the summer and fall, we are asking cat owners to take action now. Spay or neuter your cats before they contribute to this serious problem of pet overpopulation,” says Dr. Mary Ellen Zoulas, staff veterinarian at the Seattle Animal Shelter’s Spay and Neuter Clinic. The Clinic offers lower-cost, high quality spay and neuter surgeries. Through the Clinic’s “Pet Population Control Fund,” surgeries can be subsidized for those needing assistance.